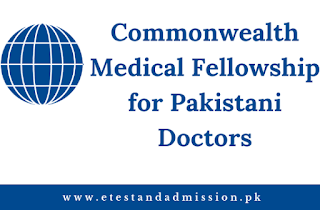 Commonwealth Scholarship Commission has invited applications for Fully Funded Medical Fellowship 2019-20. Commonwealth Scholarships are fully funded scholarship offered by the UK and funded by the Department of International Development (DID). Commonwealth Medical Fellowships will enable the Doctors from middle-income countries including Pakistan to enhance their clinical skills. These Medical Fellowships will also enable talented and motivated individuals to gain the knowledge and skills that are required for sustainable development. The duration of the Medical Fellowship is 4-6 months at any approved UK University Hospital. Be a permanent resident of Pakistan. Must have an academic appointment in Pakistan at one of the Medical Schools recognized by World Directory of Medical School (Click Here to see the List). Be employed by the hospital affiliated to the Medical School where you have an academic appointment. Must have qualified at a Medical School recognized by World Director of Medical School. Must have qualified as a Doctor on or before 1 October 2004 from one of the Medical School recognized by World Director of Medical School. Must have appeared in IELTS with a minimum score of 7.0 in each testing area and an overall score of 7.5 within 2 months of being notified that you are provisionally selected. Must have verified Medical qualification independently by Education of Commission for Foreign Medical Graduates for GMC within 2 months of being notified that you are provisionally selected (Click Here to Verify Medical Qualification). Note: Candidates must be available to start the Fellowship in the UK in January 2020. Stipend at a rate of £1,656 per month, or £2,055 per month for those at university hospitals in the London metropolitan area. Reimbursement of the fee for IELTS (only for one time) and the fee for GMC registration. Candidates can apply online from the link given below. Signup for a new account. After signing in to your account, fill the required details carefully and attach the required documents.